Choosing appliances for your home takes a good deal of thought as well as a review of your household needs. Many brands are available with a variety of features that can make the choice confusing. Maytag is a well-known brand that has a track record that is reassuring for many consumers. Maytag dishwashers can be expected to last well within the average life expectancy range of most dishwasher brands. Maytag appliances have a reputation for reliability and longevity. Maytag Corporation began in the 1890s as a farm equipment manufacturer that quickly branched out into appliances. In 1907, its first appliance was introduced, a simple washing machine wringer and tub combination that became a popular item in American homes. It became the Maytag Washing Machine Company in 1925. The company expanded rapidly during the post-war years of the 1950s, with its name brand washers, dryers, dishwashers and other appliances among the most reputable brands on the market. In 2006, the Maytag line was bought out by the Whirlpool Corporation. You can expect most dishwashers to have a life expectancy of about 9 years, according to the ConsumerReports website. Of course, how long your dishwasher will continue to give service depends on a number of factors, including the amount of food debris normally left on the dishes, how often the machine is used and how frequently the it is given routine maintenance to keep it functioning correctly. These factors can vary widely from household to household. Maytag offers a one-year parts and labor warranty and limited warranty on certain parts for 10 years. 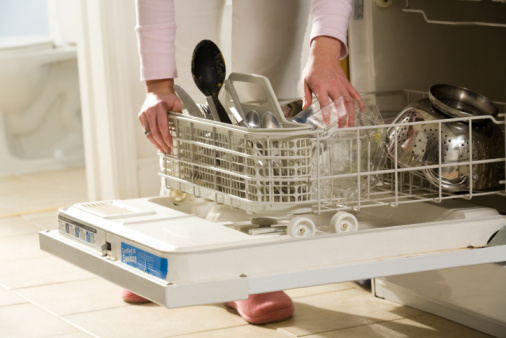 With regular maintenance, Maytag dishwashers can last longer than average. The price of the washer affects the longevity as well, with higher priced units more likely to give longer service. Dishwasher models range between $400 to $1,500. Maytag also offers a number of extended warranty service contracts on its products. To keep your Maytag dishwasher running efficiently and safely, check the moving parts regularly for blockage or visible breakage. Clean the gaskets around the door to remove food debris and dried detergent. Periodically clean the drains at the bottom of the tub as well as small screens in the door area. Replace with parts from approved service centers recommended in your Maytag dishwasher owner's manual. Do not overload the machine which makes parts work harder and wear out more quickly.